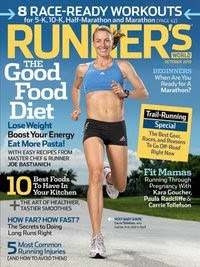 Running magazine editors like to put Carrie Tollefson on the cover, for reasons that should be obvious. She graces the current October 2010 issue of Runner's World, where she is the focus of an article on returning to running after a break (in her case to give birth to her first child). To see the article that discusses her post-pregnancy fitness routine, just click above on the title of this post.